I hope you all had a wonderful holiday weekend! For those who celebrated, what did you do for the holiday? The husband and I went to LA and we had an absolute hilarious time with the family. I just love this time of year when getting together with family means eating delicious meals and telling stories that make you fall over with laughter. We don't get involved with the Black Friday swarm but, somehow we always end up in the stores to check out the aftermath (go figure). We do like to be involved with Cyber Monday though! We also enjoyed serious competitive gaming (on the Wii...) and decorated the tree. It's definitely been a memorable holiday that I won't soon forget. P.S. I'm a guest blogger today over at Your Stylist Karen. =) Go on over and check it out if you can! I adore this skirt! Great find!! What a lovely polka dot skirt and I love the hat! I never shop in stores on Black Friday. Blech! Hi dear, this is such a sweet and adorable outfit, the bag is ultra chic. I love the girly/tough combo with the retro skirt and leather jacket. Gorgeous, as usual! 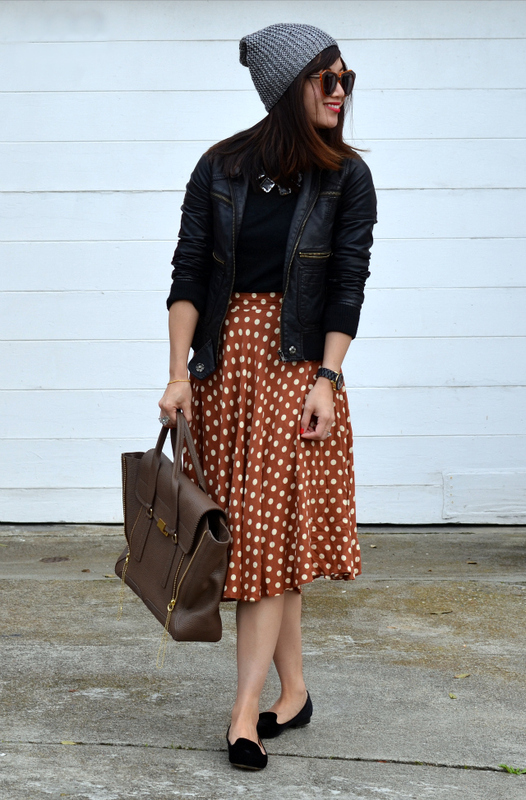 I LOVE your polka dot skirt! You look so cute! That skirt is so fun! I love the beanie and the loafers, too. So glad you enjoyed your holiday! Can't really beat good food and good company. Love this look btw. the loafers and that necklace, so pretty! I'm glad to hear you had a great weekend! I didn't hit the stores on black Friday, but I did some shopping online. 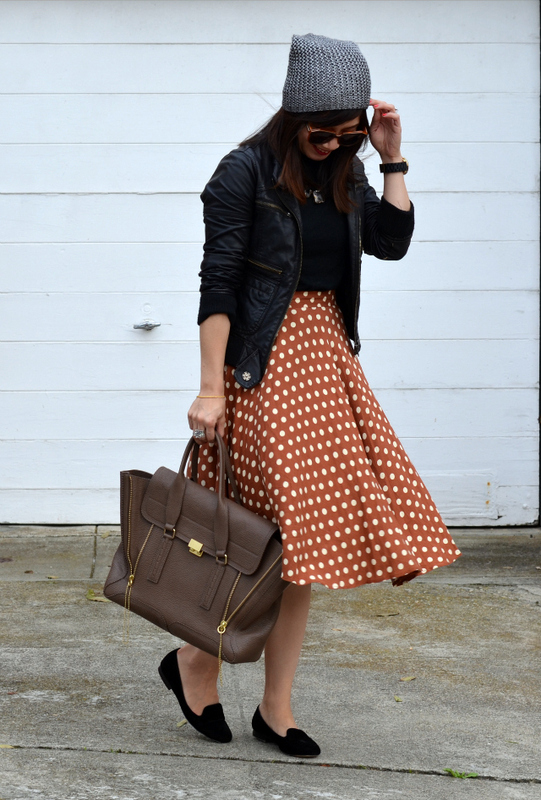 That's a very lovely polka dot skirt, it looks great with the leather jacket and that cute hat! hey nancy! so glad you had a fabulous time girl. i'm trying to decorate my tree. need a few more ornaments. hahaha love your skirt!!! it's so fabulous! 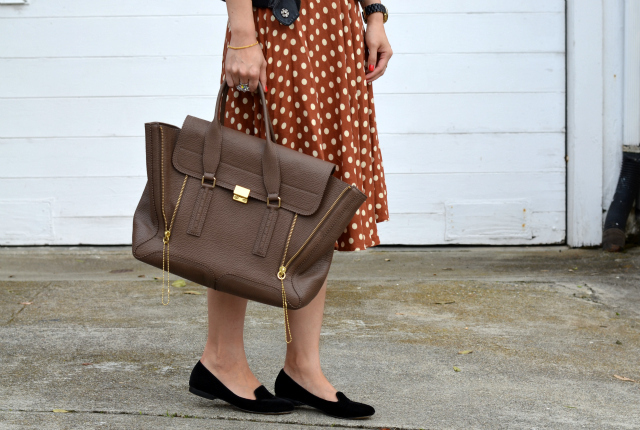 i love the caramel color and polka dots. i'm a cyber monday girl too! the best deals! Ahh, I love this outfit! 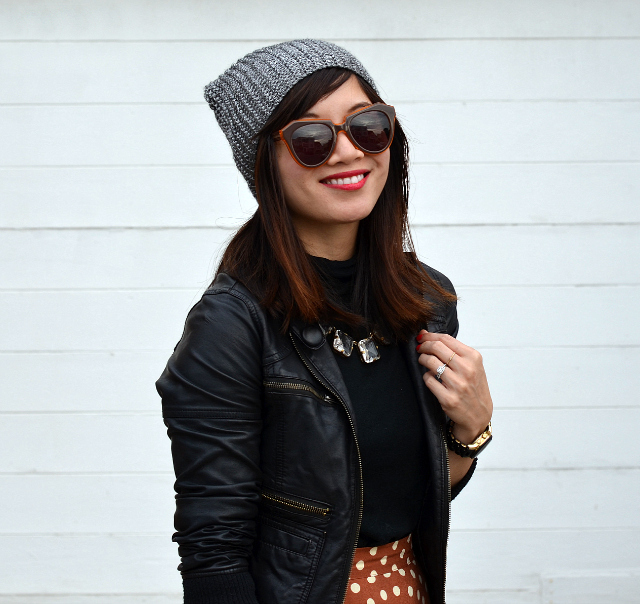 I really like the polka dot and it's a perfect length for Winter! A great mix of girly and edgy! How cute is this look ! Thanks for guest posting today! Love this skirt! love the polka dots! xO! you look so cute! heading over to check out your guest post! I also found this skirt at a thrift store! Crossroads trading company for the win! Love this skirt! The polka dots are perfect! Styling it with black makes it look so edgy! Love this look. The skirt looks great, has a great flare! :) The bag and the jacket are totally adorable!!!! I love this outfit! What an amazing thrifting find that skirt is. Glad you had a fun Thanksgiving. I love it, it's so retro!!! Such a cute skirt! Love it paired with the leather jacket. We definitely get in on the competitive gaming on the Wii too – though last year there was definitely an incident involving my overly excited Wii playing and a glass of red wine and white carpet – oops! i adore this outfit. it's very classic meets modern and perfect on you. i really just love every time you style anything with this bag. and i definitely didn't brave the swarm on black friday, but i did purchase a few things as it was my birthday! Oo, gimme that skirt! ;) Do you think it would work with the suede jacket you just posted? I can't really tell. Sometimes the same color palette works and other times the colors are too close and look like you tried to match but failed.